Tray, box lid or similar. 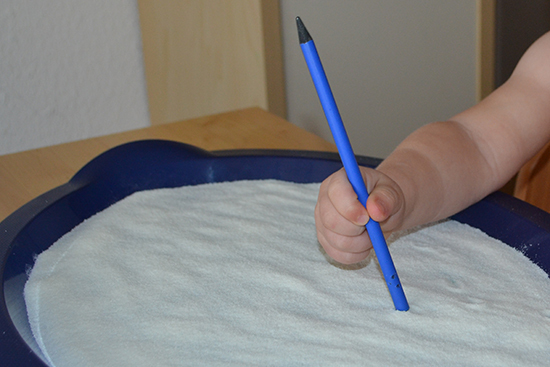 Writing implements like a pencil, paintbrush or similar (optional). 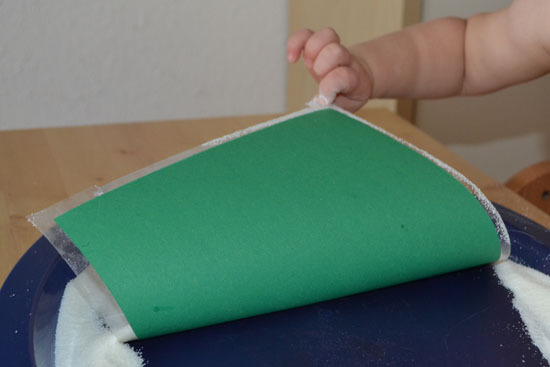 Tape colored paper in one or more colors to your tray (optional). 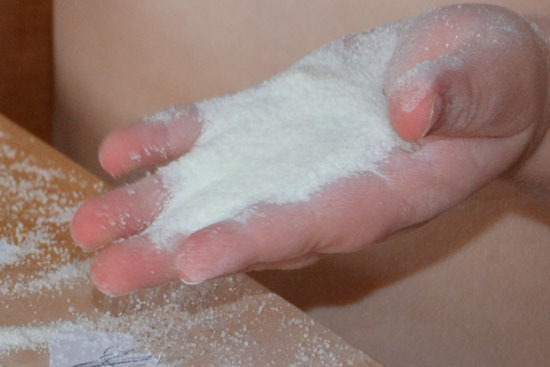 Cover your tray with a thin layer of salt. Offer writing implements (optional). 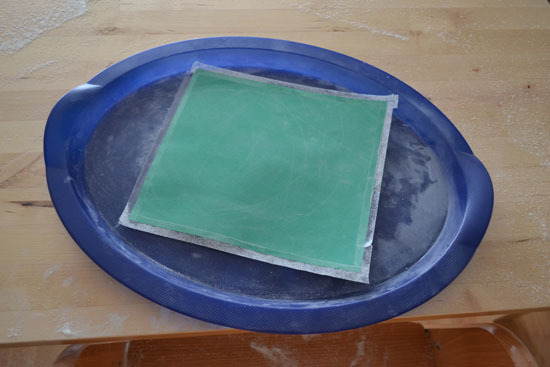 I taped one sheet of green paper to our blue tray. I was just aiming for a simple introduction to this activity but you can get as fancy with it as you’d like. E started out touching the salt quite gingerly. but preferred going back to using her hands almost immediately. This time, she dove right in. 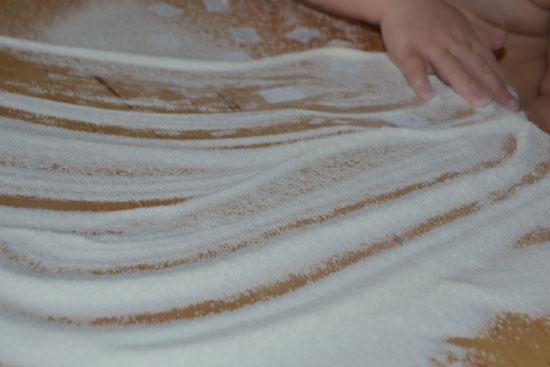 She actually used both hands at the same time to make marks in the salt for a few minutes. 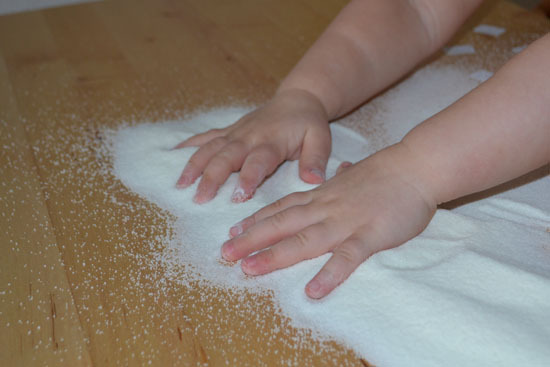 She tried different angles and got up to press her palms down on top of the salt. It apparently wasn’t that interesting, and she soon stuck it back down and spread the salt back on top. before she simply dumped all of the salt on the table and put the tray aside. but most of it ended up on the floor. 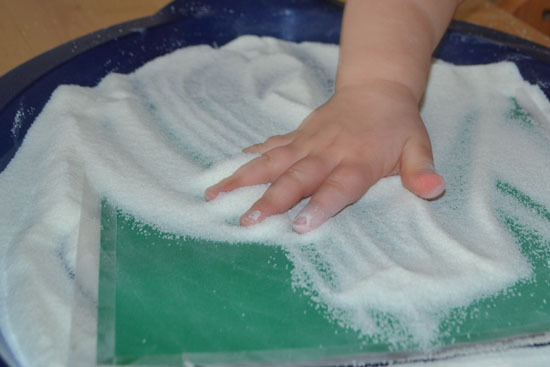 The result: An empty tray, five minutes of vacuuming (E did most of it herself), and fun memories of exploring a salt tray. I probably could’ve done with less salt. You want to just barely cover the tray. 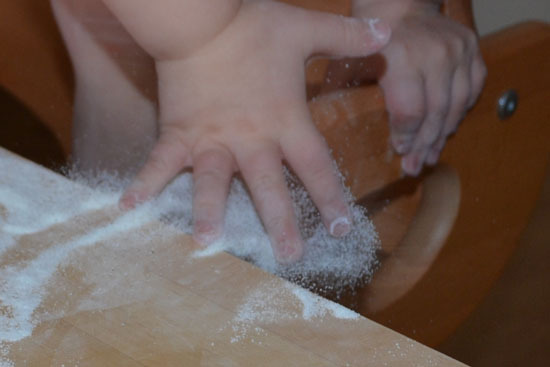 The more salt you use, the harder it is to make marks that show the color underneath. 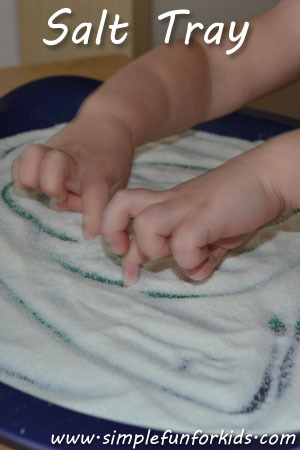 Add different colors underneath the salt that your child can discover while making marks. 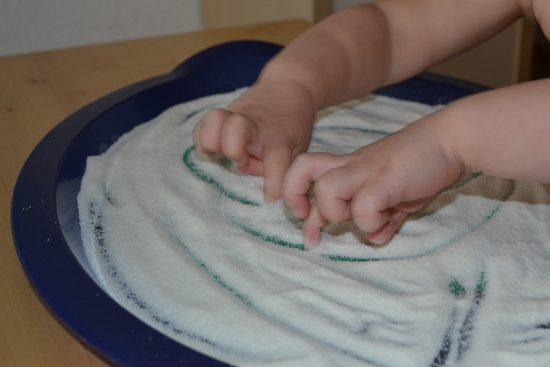 Offer a variety of items to make marks in the salt like different paintbrushes, feathers, nuts, sticks, etc. 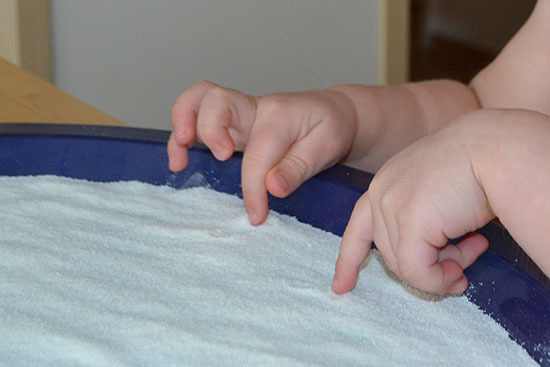 I saw the Rainbow Salt Tray idea at learning4kids.net and simplified it a bit. 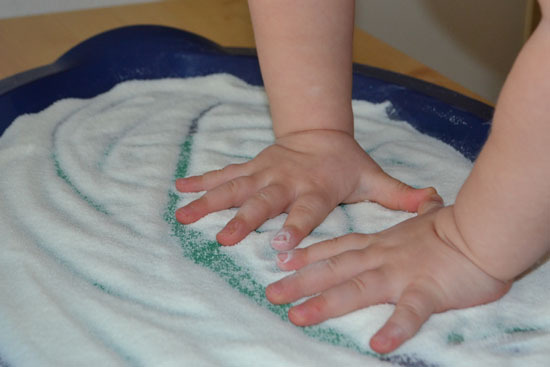 Teach Preschool used feathers to write and draw in the salt. 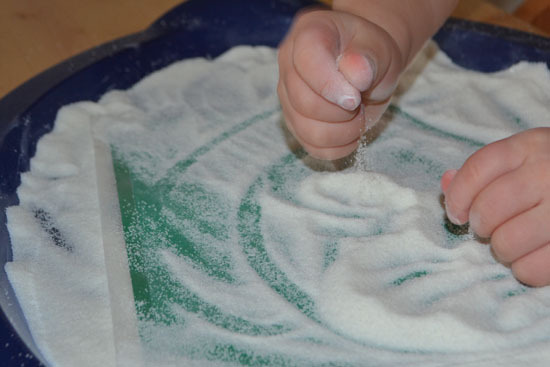 Have you used salt in a sensory activity? Have you made a salt tray? Leave a comment and tell me all about it!